Simple movies are always the best – Basic stories, good acting, tight scripts. That’s all a person can ask for. And it seems lately that Hollywood has forgotten that very basic formula. On the other hand, independent filmmakers throughout the country have not. They take pride in maxing out their credit cards, mortgaging their homes, and eating ramen for a year, so their film can be completed. Once that occurs, filmmakers enter their film in numerous festivals so it can be seen and admired. The David Dance is that kind of film. 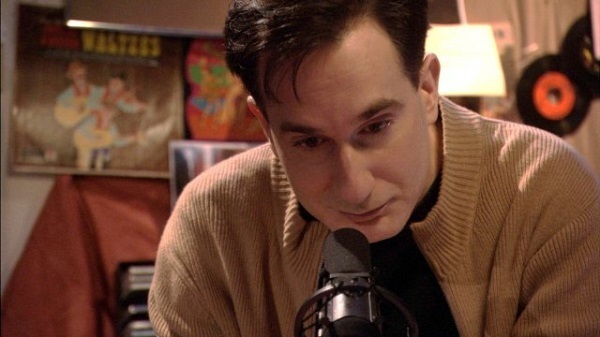 Directed by Aprill Winney, The David Dance documents the relationship between David (Don Scime), a shy gay man who escapes his reclusiveness when behind the microphone of his radio talk show, and his sister Kate (Antoinette LaVecchia), a thrice married woman who seeks validation of her life. The connection between the two extends beyond being siblings; they are each other’s best friend. He supports Kate through her numerous relationship issues, and Kate is basically his only contact of life outside of the radio station. But Kate plans to change that, when she informs David that she wants to adopt a child, and wants him to help raise her. David’s walls of isolation are tested when Chris (Guy Adkins), an engineer at the station shows an interest in him. The two men figuratively ‘dance’ around each other, as they pass around notes, almost confirming David’s need for a microphone to communicate with someone besides Kate. As their relationship becomes more serious, Kate’s determination to adopt solidifies, and she leaves for Portugal to pick up her impending daughter. Shown most recently at the Tallgrass Film Festival, where it won the Audience Award for best narrative film, The David Dance is an achingly beautiful motion picture. Winney maintains the audience interest in the film by utilizing flashbacks, giving insight as to who these characters are and what led them to this point. The characters are unique, and at times quirky, but you can’t help but care about them. The flashback moments work extremely well, except for one where she had the adult actors playing themselves as kids along with child actors. It did get somewhat confusing. As we move toward the film’s conclusion, Winney keeps the emotions real, without manipulating the audience. The film’s cast is led by Scime, who is captivating as David. (Scime also wrote the screenplay, based on his play, as well as produced the film.) Whether extorting the ferociousness of a Larry Kramer, as he verbally battles another talk show host supporting the validity of sexual reprogramming, or seeing him as he reacts to the first time he is held by another man as they dance together, there is not a false note in his performance. As Kate, LaVecchia has a uniqueness about her, making her come across as the sister you cannot help but love, yet at times you want to avoid. She has some really great moments, but there are times it becomes obvious of her significant theatrical training. In scenes that should be more conversational (for example, her initial scene in the car) LaVecchia sounds like she’s making sure the little old lady in the back row can hear her. There is a definite difference in scenes with her and other actors, although you do get used to it. As Chris, Adkin’s has the least colorful role in the film. His initial conveying of his attraction for David is hard to buy at first, But as the film progresses, the emotions and the honesty of the relationship takes over, making it far more credible. The David Dance is one of those small films you really have to search out, and I strongly recommend that you do. It’s a powerful story of people searching to find their identity in the world. It offers a performance by Don Scime that lingers in your mind long after the film is over. Aprill Winney’s direction hits a few snags, but overall it’s an excellent attempt. The use of flashbacks gives the audience a more vivid look at the film’s characters and what got them to that point. The film contains numerous plot twists, which I avoided to elaborate on. Let’s just say that The David Dance will leave you satisfied, yet still reaching for that tissue.